Happy Saturday! Time to grab your favorite cup, fill it up, and pull up a chair for a little online browse! In Needlework News Snips, I like to share little embroidery-related snippets that I’ve come across online, hither and yon. Usually, my Snips are a hodgepodge of inspiration, information, and instruction – a pretty picture or a neat project that caught my eye and that might inspire you; embroidery products, sales, or resources that sound interesting; or maybe a tutorial here and there…whatever happens to pop up whenever I have time to browse about through online embroidery haunts. It’s a good time for me to share any newsy bits specifically related to Needle ‘n Thread, too, so I usually throw those in at the end of the list. It’s a meandering journey, sometimes short, sometimes long. And the only thing required to enjoy it is your favorite morning beverage! We’ll start with a little tutorial totally hand-embroidery related. In fact, it’s at the very heart of hand embroidery, because if you can’t do this particular thing, you’d be hard-pressed to get any stitching done! Over on Luzine Happel’s blog (she writes about Schwalm embroidery, for those who haven’t seen her work), you’ll find this very clear photo tutorial on a brilliant way to thread a needle. I’ve never seen this approach, but I like it! Normally, I hold the end of the thread just inside the pad of my thumb and index finger, so you can barely see it, and I saw the needle’s eye back and forth down between my fingers onto the thread. Never fails, and I can pretty much thread a needle without even looking at it. This is a similar concept – sawing the needle’s eye over a taut thread – but much more visible. Can’t wait to try it! Elisabetta, over on Elisabetta Ricami a Mano (the blog is in Italian, but you can dump it into Google Translate and get a pretty good idea of what’s going, if you don’t read Italian), has done it yet again. She embroiders beautiful monograms, and in this particular article, she finishes one into the top of a beautifully monogrammed box. Her blog is definitely worth a browse, especially if you love embroidered monograms. Speaking of embroidered monograms, I have some news for you on that subject below….so keep reading! A reader emailed me a link to this video on YouTube, demonstrating how DMC threads are made. I think I could watch that skeining machine all day long – it’s mesmerizing. The video is in French, with English subtitles. It’s fun to see what’s behind that little skein of thread! What’s not to love about more color options?! Speaking of color, lately I’ve been playing around with Coloris, DMC’s new variegated thread line. And this has brought in a lot of email with questions and interesting bits of information from readers. One reader sent along a link to a some articles over on Ancora crafts, where you’ll find a two-part article that compares DMC variegated threads with Anchor’s variegated threads. You’ll find a link to the second article at the end of the first part. I haven’t tried this line of Anchor threads yet, but you might want to know they’re out there and what the differences are. If you’ve always dreamed of creating your own 17th Century Embroidered Casket, you’ll want to know that Thistle Threads is taking reservations for the final Cabinet of Curiosities course. You can read the article about that right here. The course is on a grand scale and it’s not for the faint of heart, but I’ve heard good things about it from readers who are involved in it now. 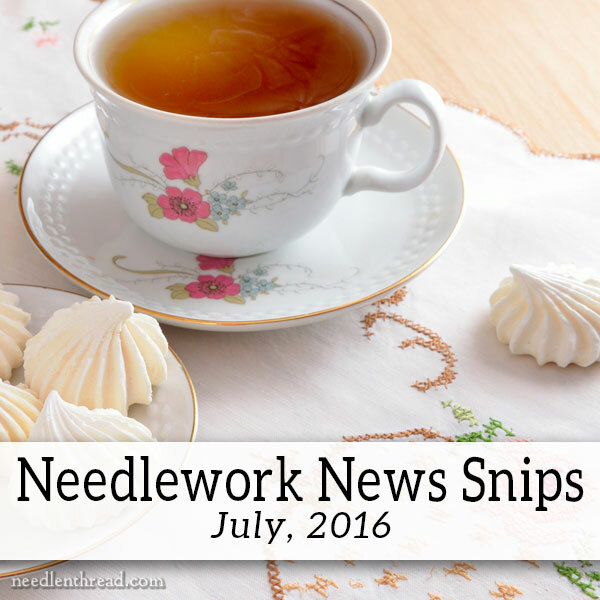 So, if you Dream Big when it comes to needlework, check it out! Wendy over on Crafter’s Apprentice is playing around with Casalguidi embroidery – I’m eager to see this develop! Casalguidi involves highly dimensional embroidered elements, so if you like dimensional, textured embroidery, you might explore it a bit! If you quake at the thought of French knots, I think I’ve found a cure. Over on Under a Topaz Sky, you’ll find this incredible French knot project. It’s definitely knotty, in a Big Way. It’s a fun blog to browse through – you’ll find all kinds of neat stitching stuff going on at every turn! What some color, texture, and vivid embroidery inspiration? Check out these embroidered letters on Yolanda Andrés website. I love them!! You will, too!! Speaking of Monograms – I’m Excited! Next week, I’ll be launching an e-book featuring 16 of my favorite monogram alphabets, all cleaned up and ready to use for your embroidery and craft needs! I’ve received a lot of requests over the years to make the monogram alphabets that I have here on Needle ‘n Thread already available in one publication for easy download. So with this e-book, I’ve done that, and I’ve added many other alphabets that are favorites of mine. You’ll find bold plain letters (perfect for free-style embellishment and voided embroidery), scripts for shadow work, some modern roman initials, as well as all kinds of decorative initials. I’m so excited!! I really hope you like it! Look for it next week! …my cup is empty. Twice. How’s yours? Time to tie up. I’m finishing up my kaleidoscope thingy today and fiddling around with a new app that just might be the answer to thread organization. More on that later! Next Next post: Forget the Adult Coloring Books – This is Much More Fun!